Full Cure Time: 24 hr. Free-flowing, ready to use, modified silicone rubber that vulcanizes either at Room Temperature or at high temperatures. 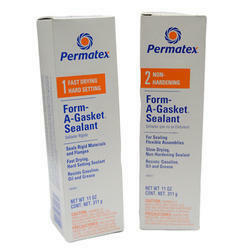 Gasket sealant is a sealant between two flanges assembled with screws. 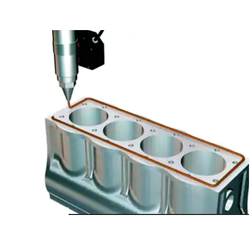 The sealant completely fills the space between the flange surfaces, thereby preventing the escape of gaseous or fluid materials in composite machine parts or pipe connections. We are guided by the crew of dexterous professionals, highly indulged in providing a huge array of Gasketing Adhesives. These products formulated with extreme precision by making use of optimum grade basic material and advent grade technology. Apart from this, we provide these products at very pocket friendly prices. The Standard Product Manufacturing Co.
Used for sealing gear box gaskets, fuel oil pipe flanges, compressor head gaskets, engine side cover. - Sets into a soft and pliable film, thus flanges/assemblies can be dismantled easily. - N paste form, covers the surface uniformly. - Withstands temperature up to 120°C. this company making to gasket sealant.